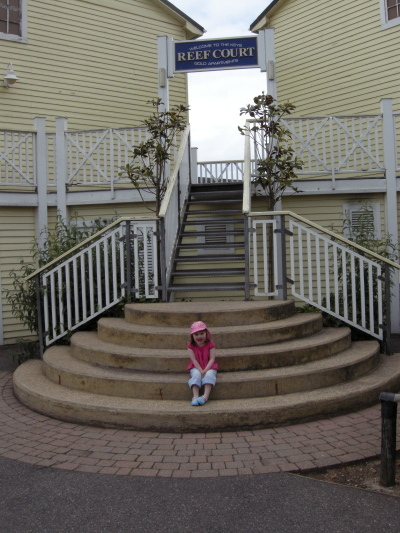 I’ve already posted a link to a Photo Diary of our recent holiday to Butlins Skegness through the eyes of a toddler. Here is a review of the holiday through the eyes of a parent. We paid the extra for Gold standard accommodation which I think was probably worth it. I last went to Butlins over 15 years ago, but back then the cheaper accommodation was poor quality. I’ve also had a very bad experience with the Silver accommodation at a former Butlins (currently Haven) site. The accommodation was to a high standard. I was however disappointed that the first floor was accessed using external stairs, although these were of better quality than the Ayr Haven site they are not very good for Babies and Toddlers. Stairs to the second floor were internal – although we were thankfully on the first floor. If booking early enough it’s worth paying the extra to get a ground floor appartment. Although the accommodation is showing it’s age on the outside it has been recently redecorated on the inside and was very well looked after. It included a TV in the bedroom, although that had a portable aerial which was not very good. There was a note saying that remote controls were removed for “environmentally friendly” reasons, this seams a little tenuous at best. Fortunately this was not the case for the main TV (at least in Gold accommodation) as having a remote control was useful for ceefax and checking the weather, which is useful when on holiday. There are two free fun-fairs on site. 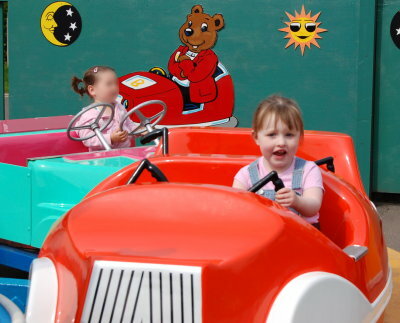 There is an outdoor fun-fair designed for all ages with a couple of rides suitable for toddlers. 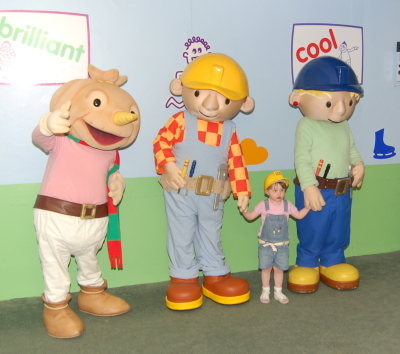 There is a second toddler fun-fair in “Bob’s Building Yard” with 4 rides designed for younger guests. If you didn’t want to pay this expense then there we a number of photo sessions, where you could meet the character. A photo was taken by the on site photographer with no obligation to buy. I was disappointed by the quality of the “professional” photographs. Considering that they had professional equipment, including flash boxes, they overexposed the photo that we had taken with Fireman Sam. Butlins Skegness is fortunate in having a great beach directly off the site. There is a bit of a climb to get out of the site (ramp or a few stairs), but then it’s straight onto the beach. The choice for eating out was a bit limited, although junk food is well catered for 🙁 The Sun and Moon pub served good traditional food at a reasonable price and was our favourite. It included an outdoor play area. We had a great holiday and we’ll definitely be considering Butlins again for a future holiday. It’s more expensive than most other self-catering holidays (except for Center Parcs) but it was well worth it. This entry was posted on Sunday, July 13th, 2008 and is filed under Babies, Children, General, Holiday, Photography, Reviews, Tourism. You can follow any responses to this entry through the RSS 2.0 feed. Both comments and pings are currently closed.